Our early community was ethnically and culturally diverse. Even though most of the houses were small and modest, every home had unique architectural characteristics. During the decades from the 1960s to the ‘80s, most of the houses of this era have been lost from commercial development and urban decay. Today, the surviving Victorian-era charm is threatened by intense development pressure. Our unique architectural landscape is under attack by developers who are replacing historic structures with bigger modern structures that increase population density. The Rayworth House is in an exceptional state of architectural preservation even though it is run-down today. The tragedy here is that a good restoration opportunity has been taken away from the community by a developer from the suburbs who will profit from his project. 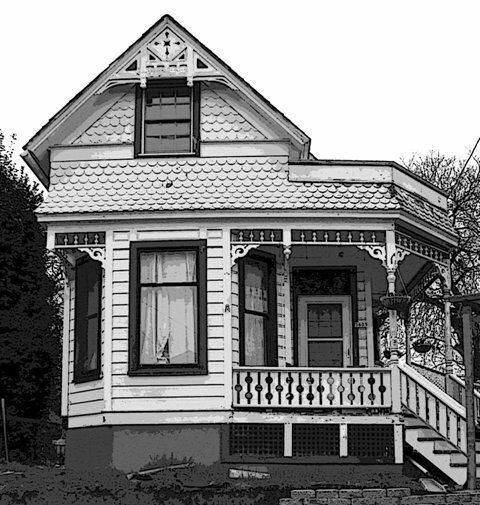 Back in 1890, Edwin Rayworth, a painting contractor and wallpaper hanger, built this house here on N Albina Avenue. Originally, Albina Avenue was called Massachusetts Street, but that name was changed in 1891 once inside the jurisdiction of Portland. Edwin Rayworth was born in Canada in 1860, and his parents were immigrants from England. In 1884, they came to the States and settled into lower Albina later in the 1880s where building activity was strong and his trade flourished. Mr. Rayworth was either never-married or a young widower and had no children and lived in the house until about 1933. Also in the 1890s, a young couple also lived in the household with Edwin. They were Edward and Emma Reichard. Both were from Pennsylvania and were only a few years younger than Edwin. Edward Reichard was a coffee salesman for Crown Coffee Company. It is not likely they were related, but they co-inhabited the house with Rayworth, who eventually turned over the title of the property to them and remained in the community through the 1930s. In 1941, the Reichards sold the house to Nick Schneider, who worked as a longshoreman, but he left at the end of World War II. Mabel Hinkson, the next owner, apparently lived elsewhere. By 1949, Thomas and Ora D. Flagg were the new owners and occupants. Thomas Flagg had a listed occupation as a “seaman” and remained here through the late 1980s. Around 1989, Norvell and Kathy Reed became the owners but lived elsewhere. In 2001, Dan Mohrmann purchased the house for his family. He had a vision to restore the house, which was in a state of disrepair, and started a slow restoration process. He worked in the trades and when the recession hit in 2008, the family went through financial hardship. Sadly, they lost the house from foreclosure from US Bank by 2010. In October, the property was acquired by Andrey Kashuba, the owner of Exceptional Homes by Andrey, Inc. based in Lake Oswego. It is clear our old close-in neighborhoods are under attack from wealthy developers from the suburbs. We face architectural pillage by them because the city is promoting high density and has deaf ears for historic preservation. Portland has been noted for sustainable living, but the destruction of old buildings and replacement with modern structures is not sustainable and results in the waste of resources. The recent recession has created foreclosures on local residents, and developers have targeted these properties getting them at low prices and profiting from their destruction or radical alterations. Like the example 1890 house here, some of them are destroying historic buildings. This loss is great to the block here, and it is nearly the most original of the earliest houses built on the block. The historic buildings in our communities give us our sense of place and cultural memory. Our old neighborhoods help make Portland special and now in danger of becoming “anywhere USA”.